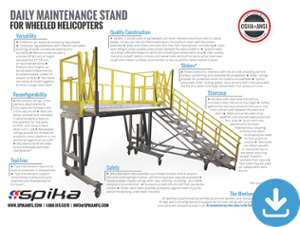 Spika’s line of aircraft maintenance stands provides efficient and safe access to a large variety of aircraft, both military and commercial, for maintenance and inspection. Our platforms interface precisely with your aircraft, whether it’s a skid-type helicopter, wheeled helicopter, cargo jet, fighter jet, or business jet. Continue reading to learn more about our daily maintenance stands, wrap-around maintenance platforms, custom aircraft maintenance stands, and the highlights of our aircraft maintenance stands. Our daily maintenance stands are height-adjustable, free-standing modules designed for regular maintenance and inspection of your aircraft. They are capable of being used alone or quickly linked to other modules to form longer, larger work platform systems. These lightweight platforms offer unmatched stability and durability without the weight and corrosion concerns, or the cumbersome maneuverability, of other stands, particularly the old B-Series stands. 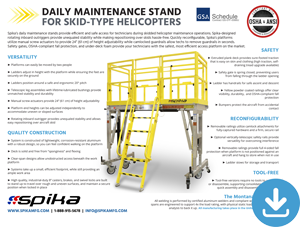 Download the brochure to learn more about our daily maintenance stands, or download a datasheet for dimensions and specifics about the work platform for your particular aircraft. Provides access to the aircraft’s wing root, top and bottom flaps, engine/propeller, top and bottom of wing leading edge, under empennage, and horizontal stabilizer. Provides access to the aircraft's nose and cockpit window area. Provides access to the aircraft's fuselage walkway behind the wings, wing walkway, and rear vertical stabilizer. 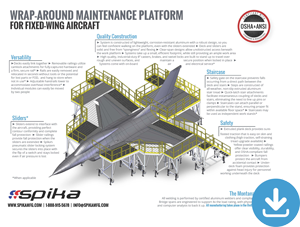 Wrap-around maintenance platforms designed and manufactured by Spika set the standard in aircraft work platforms. Most systems come with on-board air and electrical service, and they move easily to let aircraft in and out or to store. 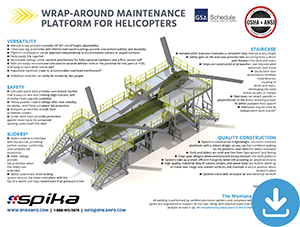 Download a brochure to learn more about our aircraft wrap-around maintenance stands, or download a datasheet for dimensions and specifics about the work platform for your particular aircraft. If your aircraft isn't listed, request a quote for a custom solution. You may also want to read more about our custom design capabilities. OSHA-compliant designs ensure the safety of your personnel. Lightweight, corrosion-resistant aluminum construction minimizes module weight for easy movement. Clear-span designs allow unobstructed access beneath the work platform. Extruded aluminum plank deck provides sure-footed traction that is easy on skin and clothing. Sliders extend to interface with aircraft, providing complete fall protection. Our pneumatic slider locking system secures the sliders into place with the flip of one switch and stays locked even if air pressure is lost. Deck and sliders are solid and free from “sponginess” and flexing so you can feel confident walking on the platform, even with the sliders fully extended. Bumpers protect the aircraft from accidental contact. Under-deck foam provides protection against head injury for personnel working underneath the deck. Camlock railing attachments utilize fully-captured hardware on a firm, secure rail; handrails are easily removed and relocated in seconds without tools or the potential for lost parts or FOD. Powder coated handrails provide clear visibility and long-lasting durability. Telescopic leg assemblies with lifetime-lubricated bushings provide stability and durability far superior to lightweight, wobbly boat trailer jacks used in other systems. Platform end heights can be adjusted independently to accommodate uneven or sloped surfaces. High quality, industrial-duty casters, brakes, and indexing pins are built to stand up to travel over rough and uneven surfaces. Stable, smooth acting variable-pitch staircases accommodate large height variances without the bottom step rising off the ground. Staircases can be designed to connect perpendicular or parallel to any side or corner, ensuring proper fit within available floor space. Simple, fast, and secure quick-latch systems eliminate the need to line up pins or clamps when attaching staircases to decks. Ladders adjust in height, maintaining an ergonomic pitch and ensuring the feet are securely on the ground. Steps are constructed of all-weather, non-slip extruded aluminum stair tread. Tool-free assembly versions support quick disassembly and reassembly, allowing for consolidated crating and fast set-up and break down for deployment.